Author’s Note: This is the second installment of a four-part series. The first in the series can be found here. War personified. When I first thought of this series, I didn’t realize how hard it would be to think of examples of war as an actual character in a book or poem. There are plenty of examples of what war is like, but not many instances of War himself. There are the obvious works: Homer’s epics Iliad and Odyssey and Ovid’s Metamorphoses. There is the somewhat lesser-known “Space Trilogy” by C.S. Lewis, in which Mars (called Malacandra in the books) makes appearances in Out of the Silent Planet and That Hideous Strength. So, much like the first post I wrote in this series, I’m going to stick to what I know and remember. Obviously, I’ll go back in later and put in quotes and links, but the point of this series – and the blog itself – is to put into writing my thoughts while running. In Western cultures, the character of War is best known as from ancient mythology; to the Greeks he was known as Ares, while to the Romans he was called Mars. Since Roman culture is Hellenistic, let’s start at the source with Greece. The Greeks saw War (Ares) as the physical aspect of war, while intelligence and strategy were assigned to the goddess Athena. As such, he himself was unpredictable and insatiable. He was the man who, once he has started a fight, will finish it no matter the cost and then take on the onlookers simply for being there. According to Homer, when Ares went to war, he brought Terror and Fear with him; some Greek scholars now say these were the names of the horses pulling his chariot. 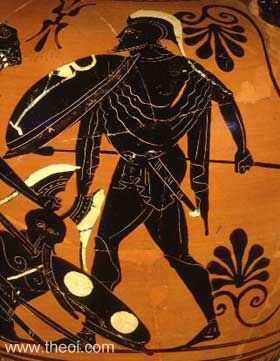 Nevertheless, with the exception of the Spartans, most Greeks held Ares in contempt. Ares went against the Greek ideal of balanced reason; therefore, he is almost always humiliated in Greek mythology. Zeus, chief of the gods and father to Ares, despises him; Ares chose the losing side in the Trojan Wars by favoring Troy while his sister, Athena, favored Agamemnon and his followers; and Hephaestus, god of blacksmiths, is able to trap him in a net during his affair with Aphrodite. On the other hand we have the Romans, who valued physical strength above mental acuity. Unlike the contempt of the Greeks, the Roman held War (Mars) in high regard. In Roman religion, Mars was usually considered second only to Jupiter. Mars was also a symbol of peace and unity. During the Pax Romana under Caesar Augustus, Rome “guaranteed” the peace of her conquered territories through force of Roman law. Unlike the division caused among the Greek pantheon by Ares’ affair with Aphrodite, Mars’ affair with Venus solidified Mars’ power over the people of Rome. Mars was considered the father of Romulus and Remus, legendary founders of the city of Rome. His affair now made him the lover of Venus, the patron goddess of Aeneas (survivor of Troy and supposed ancestor of the Latin people), and, therefore, worthy of veneration. Today, that veneration can be seen in multiple linguistic forms of the word Tuesday; in most world cultures, this day is named after a god of War. Then should the warlike Harry, like himself, / assume the port of Mars, and at his heels / (leash’d in, like hounds) should famine, sword, and fire / crouch for employment. Notice the qualities applied to Henry Plantagenet and, since Harry is standing in his place, Mars. Like the Greeks, Shakespeare has Mars bringing several cohorts with him, notably famine, sword, and fire. Like the Romans, Shakespeare considers this a notable quality. Remember that this play celebrates the more significant English victories of the Hundred Years’ War, especially the battle of Agincourt. And, who could forget Henry’s famous speech to rally his outnumbered men in which he refers to those who fight for the English cause as a “band of brothers”? In C.S. Lewis’ “Space Trilogy” – or “Cosmic Trilogy, as it is sometimes called – Mars’ “true name” is Malacandra. Malacandra is both the name of the planet Mars and the angelic being that rules it. In Out of the Silent Planet, Malacandra as a planet is old, and bears evidence of long, hard wars: the entire surface is cold and uninhabitable by the native creatures. Nevertheless, as a being Malacandra is still strong, descending to earth to help protect Earth from evil, supernatural forces in That Hideous Strength. For those desiring the complete story, please read the novels; they are quite enjoyable. What do I think of the literary interpretations of Mars? I find myself favoring Shakespeare. The idea of a man both noble in character yet strong in both body and spirit is appealing to me. Shakespeare provides the balance the Greeks and Romans lack, yet makes it achievable by showing those qualities in a living man and not a divine being. The Gods of War change along with man’s opinions of himself.